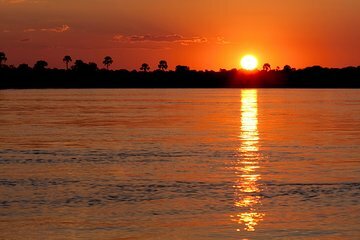 Experience the stunning beauty of the African sunset on this 2-hour evening Zambezi River cruise. Enjoy a champagne toast with fellow passengers as you gaze out over the placid waters in search of hippos, crocodiles and elephants. Unlimited drinks and snacks are a part of this relaxing evening that showcases the best of the famous Zimbabwe waterway. Your Sunset Zambezi River Cruise with Transport from Victoria Falls kicks off with hotel pick up and transportation in an air-conditioned vehicle to the banks of the famous river. This impressive waterway flows through six countries before emptying into the Indian Ocean. Set sail on a your comfortable sightseeing boat where you’ll toast fellow passengers with a glass of complimentary champagne. Relax as you take in the epic beauty of the river, where you’ll likely see hippos floating along the shallows and crocodiles lounging on muddy banks. Enjoy unlimited beer, wine and soft drinks from the onboard bar, as well as plenty of finger foods and snacks. Prepare from the stunning beauty that is sunset on the Zambezi as darkness descends around you. Watch as Cape buffalo, giraffes and elephants from Victoria Falls National Park head to the river to drink, making an already stunning moment even more picturesque. This memorable sightseeing sunset cruise ends when you return to the riverbank and step back on dry land. Your friendly driver will transport you back to your Victoria Falls hotel in the evening. Gorgeous sunset. A train of elephants entering the river from the banks of Zambia. Hippos, crocodiles and more. A distant view of the Fall's mist from up river. The staff were accommodating and ample complimentary food and beverages were provided. The Park fees were included, so we saved the 10pp. A relaxing way to punctuate a wonderful Victoria Falls stay. Very nice, very relaxing, and ample drinks, and finger food. A delightful way to spend two hours, watching the Zambezi go by. Hippos and a crocodile enlivened the experience. The food and drink on the boat were excellent. The sunset was, of course, stunning. Not much wildlife but the cruise was nice. Went on January 10th, low season after Xmas and New Year holidays so explained why there were lots of boats out on the river but few people on each. Lots of competition when times are hard there. However, picked up on time and driven down to launch site. Obligatory dance group struck up with singing and dancing as soon as we arrived so had to give a tip before getting on. There were about 20 of us altogether from different countries and it was a pleasant evening with drinks and nibbles and good service. The captain was very professional with his health and safety talk before we started. There was a young chap dressed up as a native with spear etc who unfortunately took a fancy to us and particularly seemed to want to practise his English on us! We felt sorry for him but he did become a little intrusive. We were quite glad when he went over to other groups but he did keep returning to us! We saw opposed, crocs, elephants coming down to the river to drink, kingfishers, lots of birds. We were two and a half km away from Vic Falls and could see the mist. Watched the sun go down and it was a really lovely experience. Some boats do full dinner cruises and in retrospect wished we had chosen to do that. Would recommend this tour- value for money, good transport too. Awesome! Saw an elephant cross the river! Very relaxing!